Lawrence Grossman in an undated photograph. Lawrence "Larry" Grossman, a pioneer in the field of DNA repair and a World War II combat veteran, died Jan. 13 at the age of 81. A University Distinguished Service Professor at the Bloomberg School of Public Health, he was also the former chair of the Department of Biochemistry and Molecular Biology. Grossman's crowning achievement was the development of a highly sensitive test for measuring the DNA repair capacity of individual people. The test provides a powerful tool for assessing which individuals in a population are at risk for skin cancer or for other tumors of environmental origin. In one of his studies, Grossman found that reduced DNA repair capacity appears to contribute to basal cell carcinoma, especially in those individuals with a prior history of severe sunburn. Grossman also made enormous contributions to uncovering the molecular mechanisms by which cells repair ultraviolet radiation damage to their chromosomes. A New York native, Grossman quit high school to help support his family in 1941, just one month before the United States entered World War II. Soon after, he enlisted in the Navy as an aviation cadet. At the age of 18, he was shot down in his fighter plane off the coast of Okinawa and spent two days floating alone on a raft until rescued by a U.S. destroyer. During his time as a pilot, he was twice awarded the Distinguished Flying Cross. After the war, he resumed his education, first finishing high school, then studying engineering at City College of New York before transferring to Hofstra University to complete his bachelor's degree in biology and chemistry. After earning his doctorate in biochemistry from the University of Southern California in 1954, he joined the laboratory of Nathan Kaplan in the McCollum-Pratt Institute on the Johns Hopkins Homewood campus. In 1957, after a brief stint at the National Institutes of Health, Grossman joined Brandeis University's new Department of Biochemistry, which was being organized by Kaplan. At Brandeis, his pioneering studies on the biochemistry of DNA repair assured his rise to the rank of professor. In 1975, he returned to Johns Hopkins to become the E.V. McCollum Professor and Chair of the Department of Biochemistry in what was then the School of Hygiene and Public Health. Grossman also held joint appointments in the Bloomberg School's Department of Environmental Health Sciences and the School of Medicine's Oncology Department. Roger McMacken, chair of the Bloomberg School's Department of Biochemistry and Molecular Biology, said, "Larry's vision, drive and personal warmth produced dramatic revitalization of the research and training programs of this department, and his achievements as chair continue to benefit the group." The department established the Lawrence Grossman Lectureship in spring 2004 to honor Grossman's research achievements and his 14 years as department chair. Michael J. Klag, dean of the School of Public Health, said, "Larry was a warm, enthusiastic and supportive mentor for students, postdoctoral fellows and junior faculty, and was an outstanding scientist. His legacy lives on in a strong and vital department which he nurtured and led for a decade and a half." 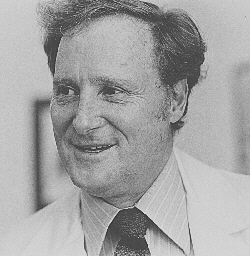 Grossman was on the editorial boards of Cancer Research, the Journal of Biological Chemistry Methods in Enzymology and Critical Reviews of Biochemistry. He also was a committee member or chair of advisory committees for the American Cancer Society and the National Institutes of Health in biochemistry and represented the International Union of Biochemistry to the National Academy of Sciences. He co-edited multiple volumes of the book Methods in Nucleic Acids and contributed numerous articles to scientific journals. Outside of science, Grossman was active in civil rights and anti-war movements (both Vietnam and Iraq) and was an avid sailor and pilot. He lived in Baltimore and was a longtime summer resident of Woods Hole, Mass. Grossman is survived by his wife of 57 years, Barbara; his children, Jon D. Grossman, Carl H. Grossman and Ilene R. Grossman; his sister, Gertrude Richards; and six grandchildren. The School of Public Health is planning a memorial service, but details have not been finalized. Contributions in his honor can be made to The Johns Hopkins University with "Lawrence Grossman Lectureship" noted on the check; they should be sent to Ricky Fine, Office of External Affairs, Johns Hopkins Bloomberg School of Public Health, 650 N. Wolfe St., W1600, Baltimore, MD 21205. GO TO JANUARY 23, 2006 TABLE OF CONTENTS.